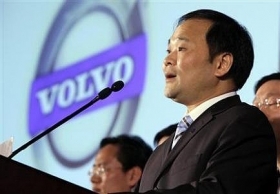 Geely Chairman Li Shufu answers a question about Volvo at a news conference in Beijing in March. (Bloomberg) -- Ford Motor Co. plans to complete its sale of Volvo Car Corp. to China's Zhejiang Geely Holding Co. next week, finishing the U.S. automaker's exit from European luxury brands, according to two people familiar with the plans. Unloading Volvo would complete Ford CEO Alan Mulally's strategy of exiting European luxury lines to focus on Ford's namesake brand. Volvo had pretax profit of $53 million in the second quarter, compared with a $237 million loss a year earlier, Ford said last week. Ford, the only major U.S. automaker to avoid bankruptcy last year, posted net income of $2.6 billion in the second quarter, exceeding analysts' estimates by 66 percent. “We expect to complete the Volvo sale in the third quarter,” John Gardiner, a Ford spokesman, said in an e-mail. He declined to comment on whether the sale will close next week. Tim Burt, a London-based spokesman for Geely, declined to comment on the timing of the completion.